Inspired by organic chemical structures and a love of all things fashion, Emiko Shinozaki started designing jewelry after many years of searching for the right medium to express her influences. The creator and designer studied pre-med and violin performance at Oberlin College and Conservatory prior to studying fashion and shoemaking in Italy. The Emiko Shinozaki Jewelry collection is a natural extension of an ever-exploring and curious mind.
" As a Japanese American raised a cultural outsider in rural 70’s Vermont, art and music were my strongest forms of expression. Sound waves fade but a precious metal object has the imprint of my history, personal aesthetics, process and handiwork." 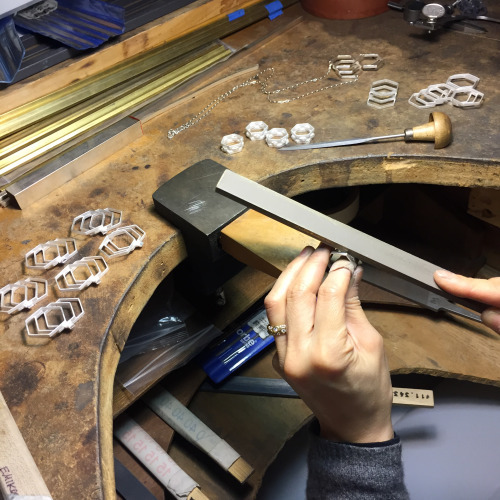 Handcrafted by Emiko and her assistant in NYC & Brooklyn, each piece of Emiko Shinozaki Jewelry is designed, soldered, formed, filed & polished individually. Some sterling silver casting and all 24K micron gold plating of original designs are done by NYC small businesses; components that are not fabricated in-house are purchased from NYC vendors only. Organic chemical structures also manifest themselves, abstracted, with symmetry imposed upon organic forms I feel are out-of-balance. Optical illusions of 3D play upon more 2D strata, creating complexities of negative space and light. Past technical practices of precision cutting and adhesion in leather trapunto are transformed into brass, silver and gold, soldered together in geometrically-patterned layer upon layer. © 2019 EMIKO SHINOZAKI JEWELRY. All Rights Reserved.